The Federal Highway Administration has launched a peer-driven, highly useful, intuitive tool designed to provide TIM professionals with the knowledge and tools they need to successfully implement program-level TIM performance measures in their state. 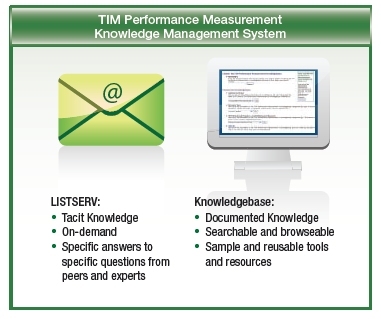 The Knowledgebase and LISTSERV offer users complementary and convenient tools to share and exchange knowledge and materials related to TIM Performance Measurement! Reduce "Roadway" Clearance Time: Time between first recordable awareness of incident by a responsible agency and first confirmation that all lanes are available for traffic flow. Reduce "Incident" Clearance Time: Time between first recordable awareness of incident by a responsible agency and time at which the last responder has left the scene. Reduce the Number of Secondary Crashes: Number of unplanned crashes beginning with the time of detection of the primary incident where a collision occurs either a) within the incident scene or b) within the queue, including the opposite direction, resulting from the original incident. Resource type. Find outreach materials to help you build support for your TIM performance measurement program, sample architectures, or data sharing memoranda of understanding that were successful in another state. Performance measure. Find resources that directly relate to TIM performance measurement in general, or specific performance measures, including any of the three core measures developed through the TIM Performance Measures Focus States Initiative—Incident Clearance, Roadway Clearance, and Secondary Incidents. A managed email list (LISTSERV): Tap into the knowledge and insights of others from the convenience of your desktop email! Keep yourself and others informed on developments and events related to TIM performance measurement, ask questions of others, share tips, or make people aware of a new document or resource that may be helpful to them in TIM performance measurement. How Can the TIM Performance Measurement Knowledgebase Help You? Search the TIM Performance Measurement Knowledgebase by keyword or browse by event, resource type, or program-level performance measure. Tap the TIM performance measurement experience of peers and experts from the convenience of your email through the TIM PM LISTSERV! Send an email to TIMPM@dot.gov to subscribe to the TIM Performance Measurement LISTSERV. Share your knowledge through the LISTSERV identify helpful resources to contribute to the Knowledgebase.